Back in March the aviation industry was hit by yet another blow when UK and US Governments banned laptops and other large electronic devices from being taken as hand luggage on flights. The reason given was that credible intelligence sources had warned that the Islamic State was developing bombs that could be hidden in portable electronic devices. According to a CNN report, IS and other terrorist organisations had obtained sophisticated airport security equipment with the aim of developing techniques and technologies to defeat airport security systems. So how real is the threat? Well, tests by the FBI have revealed, “It can be done,” ABC News reports. For example, consider the images of a working Portable DVD Player IED, below. With the lid closed on a portable DVD player that’s being used as an improvised explosive device, it is very hard to see that this item has been adapted into an IED. The only potential visual giveaway is the wire in the middle lower left side of the image and the orange colour in the material discrimination (colour) image. The wire goes into the circuit board on the right and you can make out the dark black mass that is the lead azide in the detonator. You cannot, however, see the explosives in either the black and white or material discrimination (colour) images. 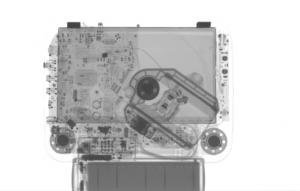 If you open the lid to the DVD player and re X-ray it, the explosives in the open player now become very clear. Therefore, the specific screening procedure mandated for the inspection of electronic articles will significantly affect whether an IED will be identified by the X-ray. Most laptops are screened with the lids closed and, consequently, the chances of detection are significantly decreased. Another Example can be seen below. 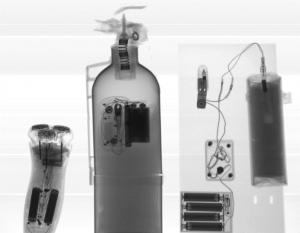 With regular black and white X-ray images potentially you might miss something suspicious and an untrained or tired operator may also not spot the explosive threat. 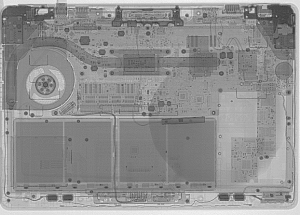 However, with material discrimination, it is clear that there is organic material in the laptop that shouldn’t be there (the orange material in lower right of the image). While the high-profile aviation ban of electronic devices has grabbed all the headlines of late, the laptop threat has wider implications not just for aircraft but airport security in general along with the wider security environment. As security screening is used to check people and their bags before entering buildings or events that are ‘at risk’, it will not be lost on terrorists that a bomb disguised as a laptop is an ideal way to infiltrate any security zone. Laptops can be used to infiltrate high-security government establishments, critical infrastructure sites, such as nuclear power stations or power plants, transport hubs, public spaces and events such as exhibitions and conferences. They may even be used in attempts to assassinate travelling VIPs such as politicians, public figures and celebrities whose security staff are routinely required to set up mobile temporary security zones while visiting foreign cities, events and accommodation. You can see in the examples pictured below just how easy it is to make an IED, from a standard fire extinguisher, which can easily be placed in a conference room or public space. Or even a shaver that can be found in any businessman’s suitcase, backpack or even a mail package (hard to see but it is packed with explosives, power source, and a detonator and uses the on/off switch to set it off). So, the question is what can be done to counter the threat? 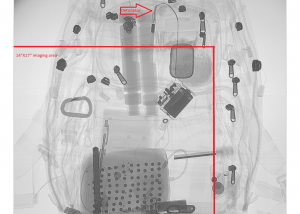 Physical searches of bags for the presence of laptops offer no real protection unless you have either the facility to swab or spectroscopically scan (SORS) the object for the presence of explosives. All you can do is establish the presence of an electronic device. Even if you do have the equipment for swabbing or a spectroscopic scan, both are liable to fall foul to false alarms because compounds that can be used to make many types of bombs – such as nitrates and glycerine – are found in all sorts of ordinary household goods like soaps, lotions, cosmetics, baby wipes and certain medications. 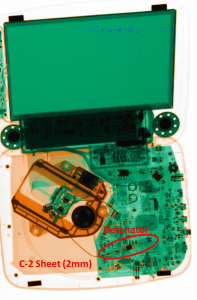 Without the ability to identify and confirm IEDs hidden within suspect electronics, the only answer is to implement a blanket ban and in today’s world that is simply not practical. Mobile Portable X-Ray systems Flat Panel scanners have, of course, been around for some years and are a crucial tool in the fight against global terrorism. They are primarily used for the inspection of left luggage, suspicious objects and for mobile temporary security zones. But laptop bombs provide a specific set of problems and challenges. 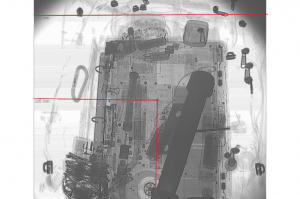 3DX-RAY with the support of the UK’s Police Scientific Development Branch and the US Transportation Security Administration developed and launched its first mobile X-ray system in the mid-nineties and has since sold systems to the military, police, transport police, border agencies and security establishments worldwide. From the beginning, the products have been in a continual state of development as technology improves and threats develop. 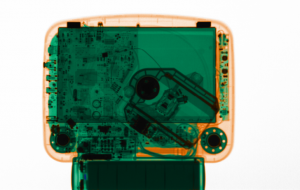 3DX-RAY quickly recognised that one of the biggest problems facing security staff is how to detect and confirm the presence of a bomb within the complex internal workings of a laptop, which makes it difficult to distinguish the explosives themselves and the detonator components. In 2015 3DX-RAY introduced the ThreatScan-LS1, which has a large 600mm x 460mm imaging area that starts only 3mm from the ground – enabling bags and packages to be scanned in one go. This powerful system penetrates up to 34mm steel at 120kV, producing high-quality, sub-millimetre resolution images. 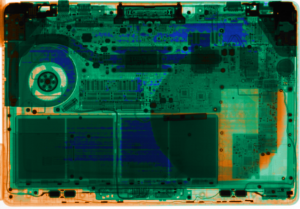 The advantage of using such a large imaging area when it comes to laptops is that it gives the operator a bigger picture of what is going on with far more detail, making detection of IED components much easier. For example take a look at the comparison between a standard 14 x 17in detector that misses the detonator (see below left) and a small 10 x 12in detector that somehow manages to miss an entire pipe bomb. Another advantage of this system is material discrimination. The vast majority of explosives are made of organic material and its presence is, therefore, a primary indicator of whether or not an explosive is contained within an electronic device. Electronics are highly unlikely to contain any organic materials and so, therefore, if you can improve your ability to differentiate between organic and inorganic materials your chances of detection are greatly increased. This technology, is of course, familiar to everybody that has been to the airport, but today it is much more accurate and easy to achieve with portable X-ray systems, with no need for any additional accessories mounted on the X-Ray source itself. Not only that, but 3DX-RAY has also added a sophisticated material probe function, which allows the operator to ‘peel away’ the external inorganic material and reveal the organic material that’s hidden behind it – a true lifesaving ability. 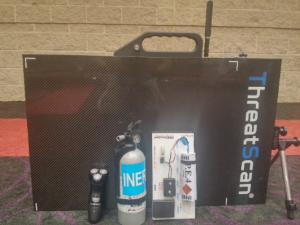 The threat from IEDs hidden in electronics devices is here to stay, making systems like the ThreatScan-LS1 a vital tool in keeping us safe. Liron Naor, MBA, is 3DX-RAY regional director of sales for Europe and South America. He has over 15 years experience in the homeland security and Hi-Tech markets, with specific focus in portable x-ray systems.